Permit your signal transmitter to alert you to different signals. Have your signal transmitter bring you alerts of various signals. 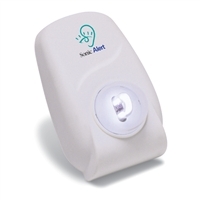 The Sonic Blink signal transmitter, the BL300, is one of the most powerful products Sonic Alert has on the market today. This signal transmitter has a built-in strobe light, designed for signaling. This powerful sonic receiver's strobe light projects 360 degrees of flashing to remove blind spots. How this sonic receiver works is it receives a signal from one of all the transmitters. Following that, the strobe light on the signal system will be activated. Depending on which transmitter is activated, the signal system may have a different flashing sequence.